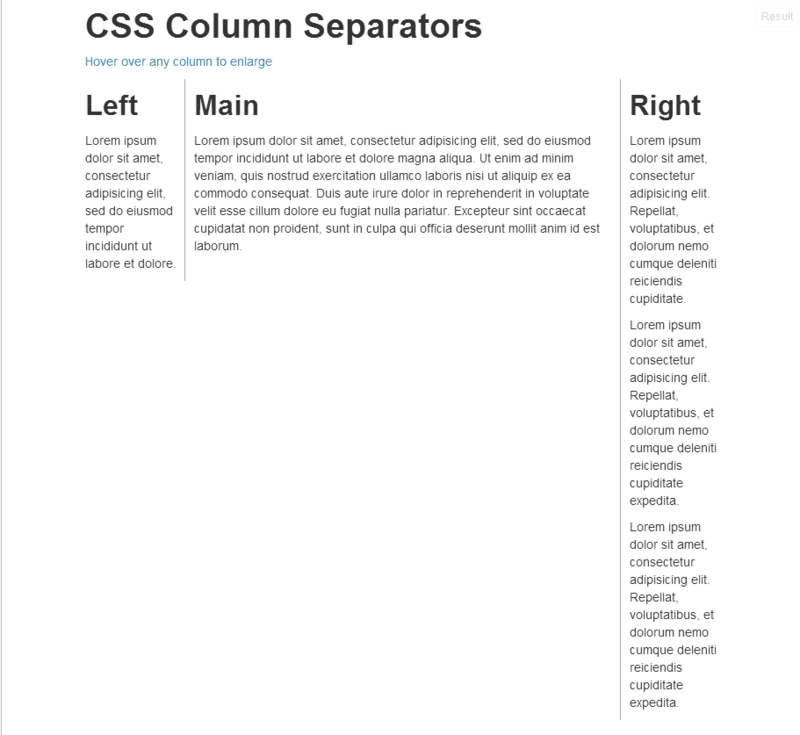 This article shows how to design column separators for common grid layout systems. Sample code as jsFiddle. The solution should work for all grid systems that use floated <div>'s to represent columns. I'm using Twitter Bootstrap quite a lot these days. 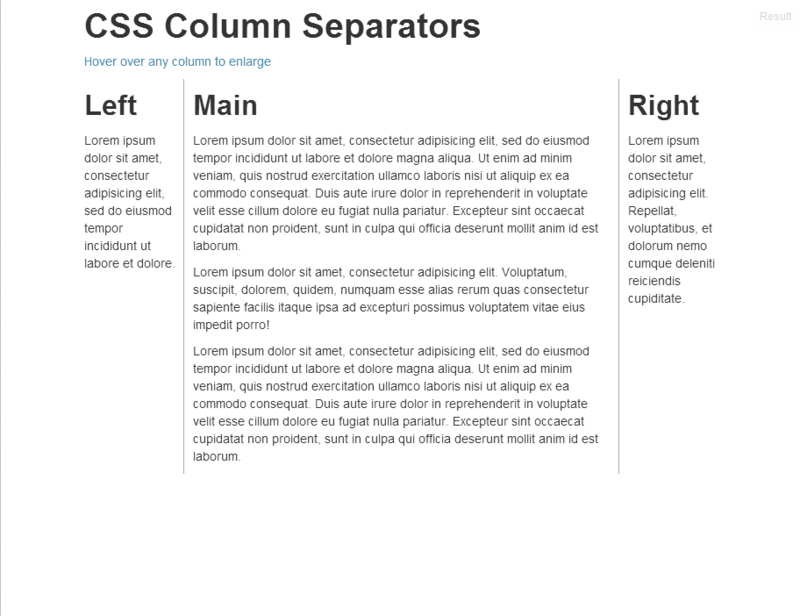 One of it's nice features is the grid system which makes it easy to design multi-column layouts. And of course there are many other similar grid systems out there (960 grid system being one of the first of them). Most of them work by aligning floated divs side by side. What many of them are missing though is the possibility to show column separators, i.e. lines in the middle of two columns. Extend to longest column I wanted the separator between two columns to be as long as the longer one of them. Note that this is a design decision, there are of course cases where the separator should only be as long as the shorter column (for which I have no simple solution, yet). No extra markup This goes by itself, of course I didn't want to insert extra markup in my HTML. 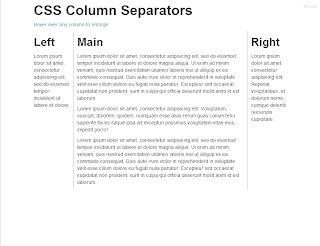 Column separators should only be set by applying appropriate classes. The first attempt is to use CSS's border property. This sounds easier than it is: common grid layouts use either padding or margin to create the space between columns. 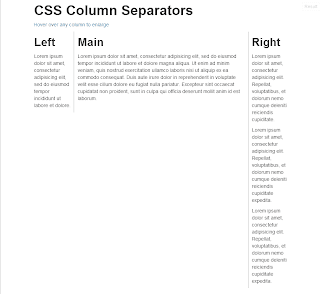 But the border in CSS's box model sits right between the margin and the padding, so we would need to fiddle with both values to place the separator in the center between columns. And since most grid systems put some care in getting the values right we will very likely brake the layout, at least in border cases. So our solution involves an additional element representing the separator. This element sits right in the middle between the columns, using position: absolute; and the proper right respectively left properties. We define two classes, .border-left and .border-right. 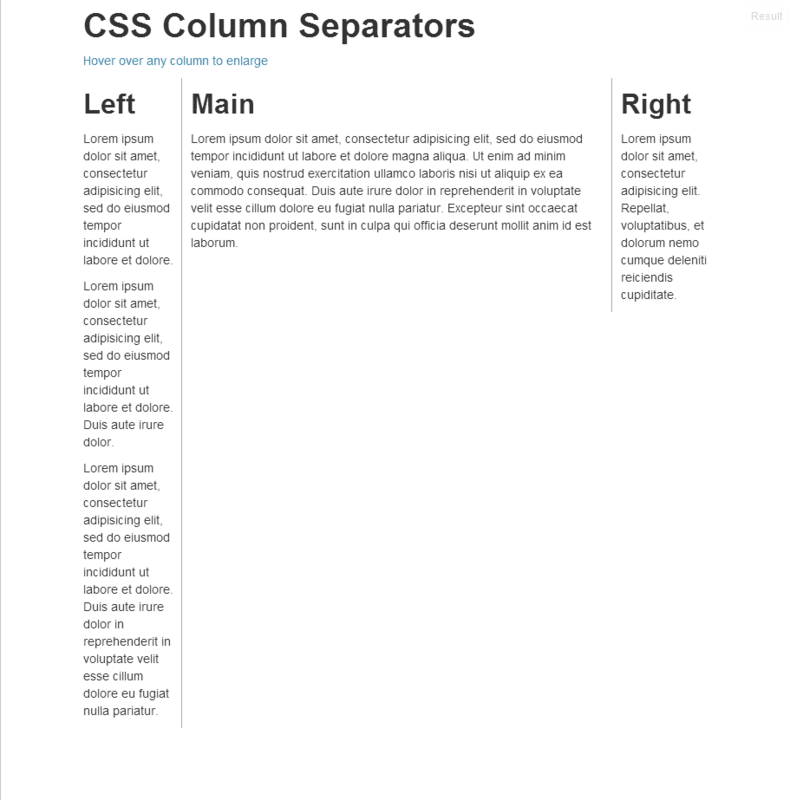 A column having class="border-left" will have a separator to its right neighbour, class="border-right" separates it from the column to its left. The classes are applied to the <div>'s representing the columns. Since we want to position the separators using position: absolute, we must make the 'anchor' elements (i.e. the columns) positioned relatively. Note that the CSS standard states that the pseudoelement is inserted inside the main element (just before its content), so absolute positioning works as wanted. the left and right values differ by one pixel. That's because there are exactly 20 pixels between the columns (at least in Bootstrap's standard grid system). Therefore there is no single "center pixel", the center line lies between pixels ten and eleven. So we have to choose one of these pixels, in our example the choice was eleven. The value for left and right depends on the settings for your layout system. Bootstrap uses 20px you might adapt these values if you use different gutter widths. For Boostrap, an elegant solution is to use the LESS sources, @import 'variables' and calc left and right using the @gridGutterWidth. In order to work for even and odd gutter widths, you can do left: -ceil((@gridGutterWidth+1)/2) and right: -floor((@gridGutterWidth+1)/2). 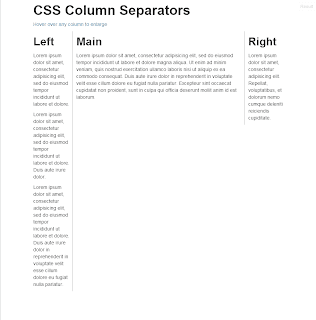 So what if we want a column to have separators on both sides? Ideally we would simply apply both classes (.border-left and .border-right) in this case. Unfortunately this doesn't work right now. For each element, there is at most one :before-pseudoelement, so we cannot generate two column separators (right and left) with the code above. You can also design them using some bitmap pattern. Remove the border, give them a width and a background-image. I hope this article was of some use to you. I really like the things you can do just using CSS and I keep discovering new ones on every project I do. how to set the left and right properties inside the proper @media queries?